Drop in with your children during any of our open bounce hours (parties may affect these hours) to play on all our giant inflatables! 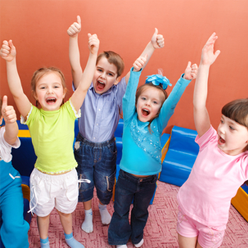 At $8 child/per hour, you won’t find a better deal for your kids to have fun bouncing, laughing, and exercising. 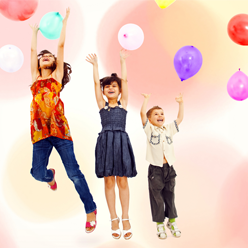 You don’t need a special occasion to enjoy all the fun of our bounce rooms provide! PLEASE MAKE SURE TO ALWAYS BRING SOCKS! “Open Bounce” – when both of our bounce rooms are readily available to the public. Kids are able to roam back and forth without being limited to stay in one room. “Rotation Bounce” – we have one party going on. Since our parties are private we must close down a room for them but the other room is still available to the public, every half an hour they switch rooms. Don’t fear, kids will still be able to jump in both rooms, the only difference from open bounce is that they must wait for their switch! “Toddler Bounce” – similar to open bounce but aimed more for toddler ages (5 and under). Ages 16 and under. All bouncers are required to wear socks in order to play in our bouncers. Please no food or outside drinks. The sessions include music and, of course, an hour of play time in our giant inflatables. Bouncers will be supervised by our staff. Price: Admission is $8 per child/per hour. Bouncers will be supervised by our experienced staff. Price: Admission is $8 per child per hour. Non-walking infants are free but please note that children must be able to walk to play on our bouncers. For Open Bounce, we charge a minimum of one participant of your group regardless of age. All participants under the age of 18 must be accompanied by an adult. Parents are recommended to go on/in the bouncers if their toddler needs assistance (not allowed to free jump). Please note that these times are subject to change without notice. Please call ahead to confirm/reserve a date and time. Please check our schedule for more details. Schedules are updated automatically based on availability between our parties.